If you know of my relationship with God, you would know that I never ask for anything when I visit temples. I always thank God for everything in this world and leave as it is. I actually visit temples just to experience the good vibes or sometimes because they are a historical or architectural marvel. However, today is different. I am at the Siachen Glacier Base Camp. THE fricking SIACHEN. I had never ever imagined I would be here. I had come on an impromptu trip to Ladakh to surprise my younger sister who was getting posted out shortly. We had initially not planned to go anywhere. I was okay with just resting in a room for the next one week as this trip was about spending time with her and not about crossing the touristy checklist. I had planned to do that sometime later on another trip with my husband. However, here we were, after a very sudden last-minute plan and 6 hours of breathtaking mountain ride (in a very comfortable car). A couple of miles from where we stand is the snout where the legendary glacier begins. I am standing in the legendary 'OP Baba temple' where a special aarti is being conducted as today is the 'Bhandara day', an auspicious day on which the designated soldiers begin their treacherous journey to various posts in the 70 km long unforgiving glacier. As hundreds of bells chime ryhtmically in the icy wind, soldiers take the blessings one by one and leave for their duty, some never to return back. As I take in the beauty of the razor-sharp summits of mostly naked mountains around, I take a few seconds to close my eyes to the deity ahead and say my typical prayer, "Thank you for these soldiers. Thank you for my husband. Thank for my family. Thank you for everything. A baby, maybe?" I am surprised by my own admission. It had always been somewhere at the back of my mind but it suddenly flashing in my prayer was a shock to myself. I wish we were one of those annoyingly sweet couple who had a cute story of how they made their baby. Unfortunately, we don't remember. Except, that the only possibility it could have happened was the brief window we got just before I proceeded on a trip to Ladakh. We had decided to try for kids at the beginning of the year, except, by twist of fate and ever changing plans, we barely were together throughout the year - I had been constantly travelling and when I was home, it would be my husband who would have to be away on a course or training etc. So when the two pink lines appeared on my pregnancy test kit a few days after my birthday, it came as a pleasant surprise. Also, a feeling of, "F**k, this is it!". I faintly remember having a similar feeling a day before my wedding - excited about something yet knowing it has the power to change your life entirely. I was happy, but mostly freaked out, "How would I ever go through this? Am I able enough to carry safely a child? What if something goes wrong? I've never been a baby person - will I make a good mother?" The first trimester went by in a weird mix of excitement and fear. And A LOT of medical tests. Few weeks in, I had my first ultrasound scan - which, because I was in such a hurry to pee - couldn't focus myself to see (also because of the weird position of the screen). Just an answer in affirmative to All ok? and I rushed out like a Shatabdi. I started taking care of my diet and having more fruits and milk than I had since I left school. I was really really anxious to get through smoothly and safely. It helped that I had quit my job and joined in a PhD program just a couple of months ago so at least I didn't have the pressure to balance my life with work. At the end of my first trimester, I moved to Mhow for the next three months to be with my husband who was on a course there. He had already been there for a couple of weeks and as we received our accommodation late, I travelled alone in the train. The three months there were very pleasant. I loved living the small town life in our two room house, with friends all around and so many options to eat! We tried everything for classy restaurants to roadside panipuri to poha on a thela! I cannot thank God enough that I had an incredibly smooth pregnancy. Like I didn't even puke once, duh! I did not display any other pregnancy symptom as well - no nausea, no cravings, no paon bhari hona - in ALL THE 9 MONTHS! I had already had a round chips-and-cola belly before I conceived so till the fifth month, I didn't even get to see that 'baby belly'. Heck, I kept on doubting if I was pregnant AT ALL! But the ultrasound had been showing a baby inside, so decided to have a little more faith. It did eventually appear and the baby ensured to make his presence felt through regular kicks. 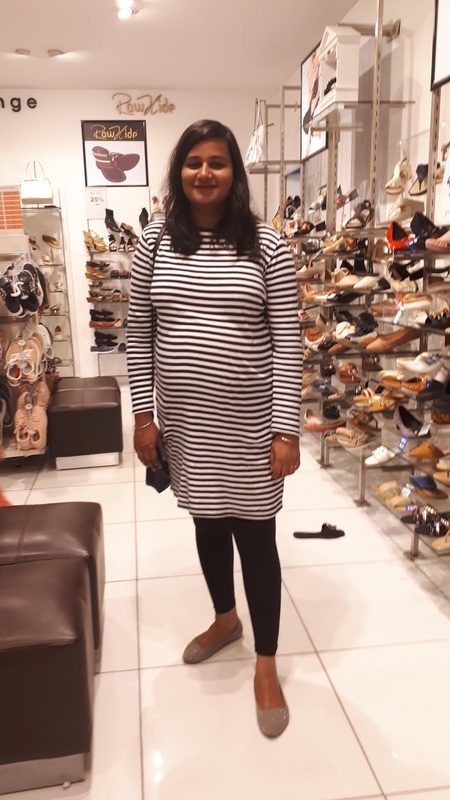 Somewhere around the beginning of my third trimester, we moved back to Jammu. It had been just a couple of days in when terrorists attacked our station. We could cruise through the incident safely and while in the coming weeks the husband left for his field tenure, I started preparing for childbirth. My in-laws moved in with me in my 8th month and on a regular hospital visit my gynaec informed that my baby would be arriving at least two weeks earlier than my due date because of my higher sugar levels, freaking me out!